AQUA TAIWAN is Taiwan's exclusive show for the industry that's packed with solutions. The three-day event will join the experts and professionals at feature events like the Southern Taiwan Forum on Water Management (Kaohsiung City Government), Business Forums, Business Matchmaking Meetings and seminars as well as Hot Product Launches. 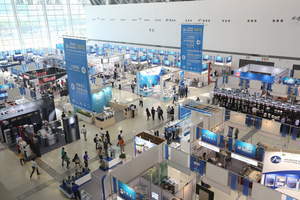 The Taiwan Water Industry Pavilion is where top state authorities network with industry to highlight the latest progress. Taiwan's Water Resources Agency (WRA), Ministry of Economic Affairs and related water agencies who are out to show the newest projects and to clarify the latest policy trends in water and their improved services. Major exhibitors include ITRI, CHINA ECOTEK, EMS, TankPac, HUNG PUMP, WALRUS, Yen Sun, Sheng Tai, and Lan Shan. Their showcased products include the Wall-Mounted Basin Mixer (2016 iF Gold Award & red dot design award winner), an emergency water supply system for remote or disaster-stricken areas, an electronic control pump (TAIWAN EXCELLENCE 2016 award winner) and a smart digital meter (TAIWAN EXCELLENCE 2016 award winner). By 2025, 80 percent of utilities in the advanced world and 50 percent of city utilities in developing-economies will be using smart water systems with a total value of US$25bn. These devices reflect the battle for quality water with better ways to detect leaks and costly failures. And it all begins at Aqua Taiwan. The 3rd Taiwan International Water Show will be held from October 20-22, 2016 at the Kaohsiung Exhibition Center in Taiwan. This year sees double proceedings for ISO 20121 certifications for both the Taiwan International Water and its venue. This is Taiwan's first its kind double-double certification for an event and venue. The review covers such criteria as exhibition areas, business matchmaking meetings and seminars. Founded in 1970 to promote foreign trade, the Taiwan External Trade Development Council (TAITRA) is the foremost non-profit trade promotion organization in Taiwan.